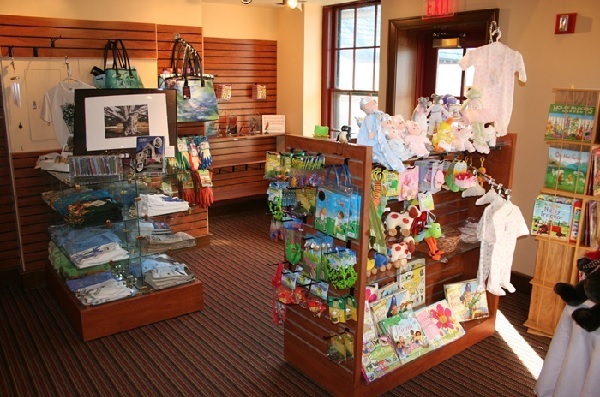 Slatwall Retail Displays present versatility and organization to your retail store. All Store Displays provide a variety of slat-wall fixtures in different sizes and shapes, colors and material. Some of these wonderful components rotate while others sit stationary on your counter tops and some are double sided for extra display space. Floor fixtures with the slatwall design may include accessories like shelves, bins, hooks and more to aid you with the proper set-up needed to showcase your merchandise with ease. Take a peek at all the various colors, shapes and sizes and select the best fit with your store's design. So allow your slat-wall fixture to work for you and sell more of your products in style. 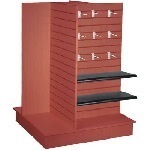 While you are browsing around in our website check out pricing of these organizational fixtures, slatwall panels, display shelving along with our other products and equipment. One of the excellent things about slat wall panels and displays is how extensively you can customize each individual panel. With the right accessories, you can add extra shelving, create cube shaped cubbies, design and alter peg hooks, add wire baskets plus so much more. Sell more products on these uniquely designed fixtures. Slatwall displays and panels make it easy to redesign and adjust your merchandise for a refreshing new look and appeal anytime you choose. Utilize space better by including the revolving fixtures, they offer double the products displayed which in turn could possibly increase sales. 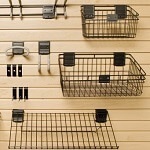 No matter what type of store you own, slat-wall displays are an excellent way to hang and organize products. So supply your customer's with the right tools today!